Brianna Conley at 2008 Polgar! The up-and-coming Brianna Conley is appearing once again as the Ohio representative at the Susan Polgar Invitational. The Polgar tournament is the counterpart to the Denker Invitational featuring all the state champions from around the country… including Alaska and Hawaii. This year the tournament is taking place at Texas Tech, the university where GM Polgar is a resident scholar and is running SPICE, the Susan Polgar Insititute for Chess Excellence. 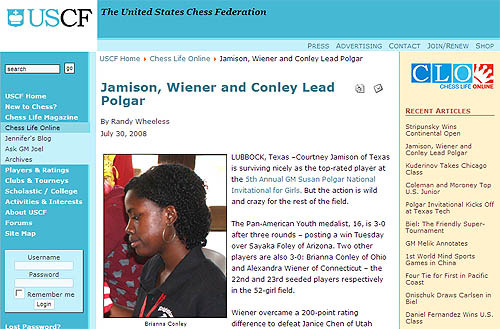 Conley played in the Polgar tournament in 2005 and ended with a plus score beating her role model Stephanie Ballom in the process. Earlier this year she placed 3rd in the 5th Annual National All Girls Open Nationals in the 16 and under section. Currently Brianna has a perfect score after upsetting second-see Sylvia Yang. There are a number of scholarships on the line. Stay tuned! Brianna came in 7th overall out of 52 players! Congratulations Brianna! Mother/Sister/Queen,keep doing your thing!! has come a long long way’s from when she first started, playing chess.